Below is a message from Kerri Marks. She and her husband Dan, and family, are having a New Year’s eve pot luck party at their home and has asked me to extend an invitation to our broader ohana. Kerri and Dan have been a great help in many of the important issues for justice and peace. They have been especially good at documenting and putting on facebook/youtube videos and keeping a calendar of upcoming events. 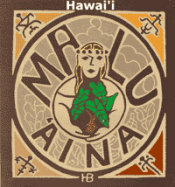 Whether or not you can make the party, blessings for justice and peace to all in the New year and a special mahalo to Kerri and Dan. Don’t be a Grim Reaper! Resist the Global Nuclear Cliff! 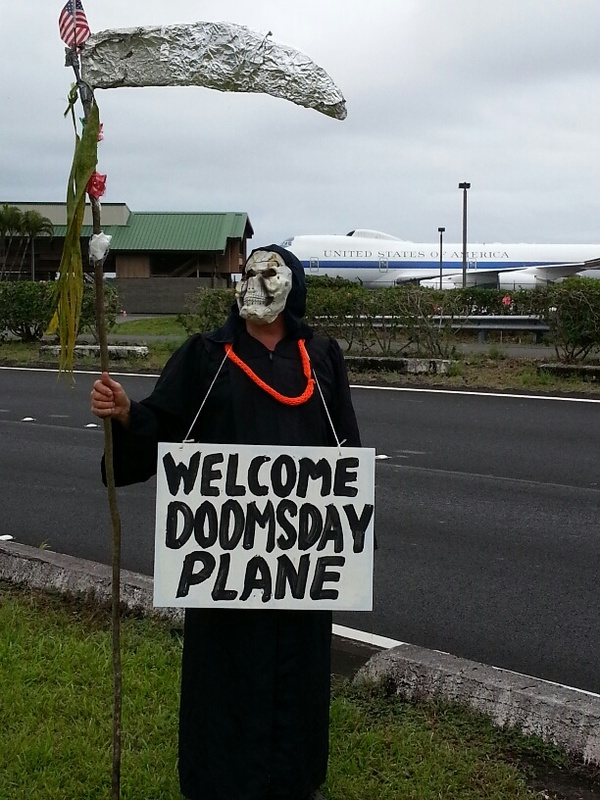 The Grim Reaper gave a warm welcome to the “Doomsday Plane” at Hilo airport on Christmas eve. 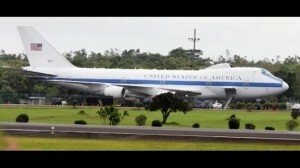 The “Doomsday Plane” is a 747 aircraft that is on 24-hour standby at Hilo airport anytime President Obama is vacationing in Hawaii. It serves as an operations and command center in the event of a nuclear war. 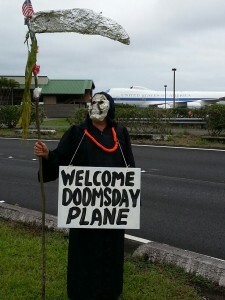 The Grim Reaper, normally a man of few words, said, “it is a special honor for Hilo to host the ” Doomsday Plane’ on Christmas instead of celebrating the birth of Jesus –the Prince of Peace. As the Grim Reaper, I say instead of peace on earth, good will to all, lets make war and celebrate killing and violence. The Doomsday Plane is a big step up from semi-automatic assault weapons. 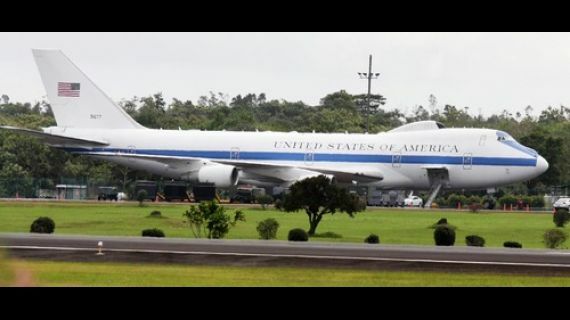 With one order the “Doomsday Plane” can fry-in-a-flash children all around the world. Resist The Global Nuclear Cliff — for Auld Lang Syne!